Eat healthy, lose weight, join a gym, get more sleep… It’s easy to make New Year’s resolutions but most people have a hard time keeping them. For me, the key to keeping New Year’s resolutions is to be honest with yourself by setting realistic goals and adopting behaviors you can live with. In that spirit, I’d like to share my plan for the new year. Diet: My three fruits per day will be two raisins and a glass of wine. Cutting carbs is never easy, so rather than set myself up for failure, I won’t even attempt this. However, when choosing brown food over white food, I will include two servings of chocolate (one dark and one milk). This way, the milk chocolate can double as one of my two dairy servings. The other, a cup of ice cream (any flavor). To reduce meat intake, I’ll cut bacon to no more than 3 slices with my weekend breakfast or brunch. And a daily glass of V-8 to wash down a multi-vitamin should cover my veggies. Weight: Some people weigh themselves every morning, but I’ve always found once a week to be sufficient. 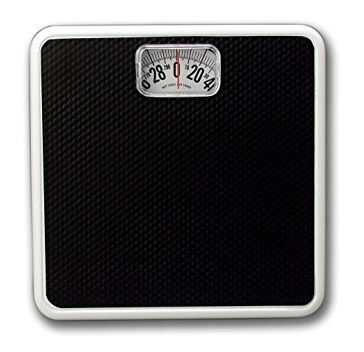 Funny thing: back in October, my scale broke. I haven’t bought a new one and I’m not sure I need to because I really don’t miss this weekly ritual. Exercise: The gym is conveniently located a few doors down from the drug store and supermarket in the strip mall nearest home so I can easily go to the gym a few times per week. If I park at the far end of the parking lot, and walk, I don’t even have to actually go into the gym. I can just go past it on my way to the market where I’ll be buying all of my healthy food. Sleep: The sleep experts advise getting up and going to bed at the same time each day. This would mean getting up at 6 AM on Saturday and Sunday. Seriously? What if I don’t set my alarm clock over the weekend and simply leave my rise-and-shine time up to fate? I do resolve to go to bed earlier. My goal is to turn out the lights at 1 o’clock. After all, you can’t get much earlier in the day than 1:00 AM. This should all work for me – hope it’s helpful for you. Happy New Year! The following is a re-post from December 2017. “Are you ready?” friends kept asking. And it was starting to vex me. Ordinarily, I would be ready. But with a week left before Christmas, there were cards not yet written and cookies still to be baked. Moving in November had really messed with my holiday preparations this year. Intuitively, I knew I needed some Christmas spirit. And an afternoon of Christmas carols sounded like just the thing. But as I traveled the long, convoluted train ride to Dorchester I wondered if my time might have been better spent preparing for the holiday. I was behind and still had so much to do before Christmas. 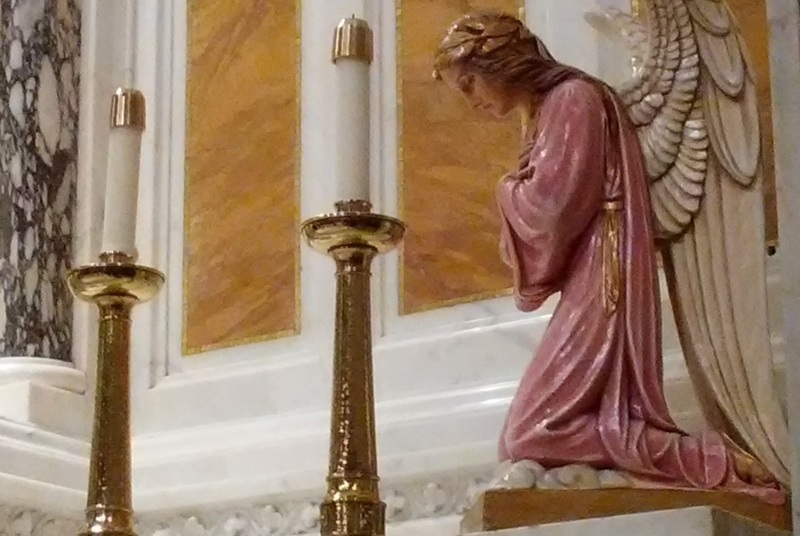 The concert was held in a beautiful old Catholic church with magnificent jewel-tone stained glass windows and majestic statuary. Even thought I had not been there before, I felt welcomed amidst all the familiar symbols of my faith. Shards of late afternoon sunlight streamed through the stained-glass windows, and I settled into my seat in the crowded church pew. The young singers and musicians were middle- and high-school aged and they represented four different Boston choirs and musical ensembles. As they gathered on the steps of the altar, I couldn’t help but notice that these youngsters were a diverse group – in age, in height, in ethnicity, each one beautiful and perfect in his or her own way. I knew by reputation that they were talented and the moment they began to sing, their pure, sweet voices touched my heart. This, I thought, is what angel voices must sound like. A peace I had not felt for some time came over me. Yes, I thought, I am ready. I am ready for Christmas. 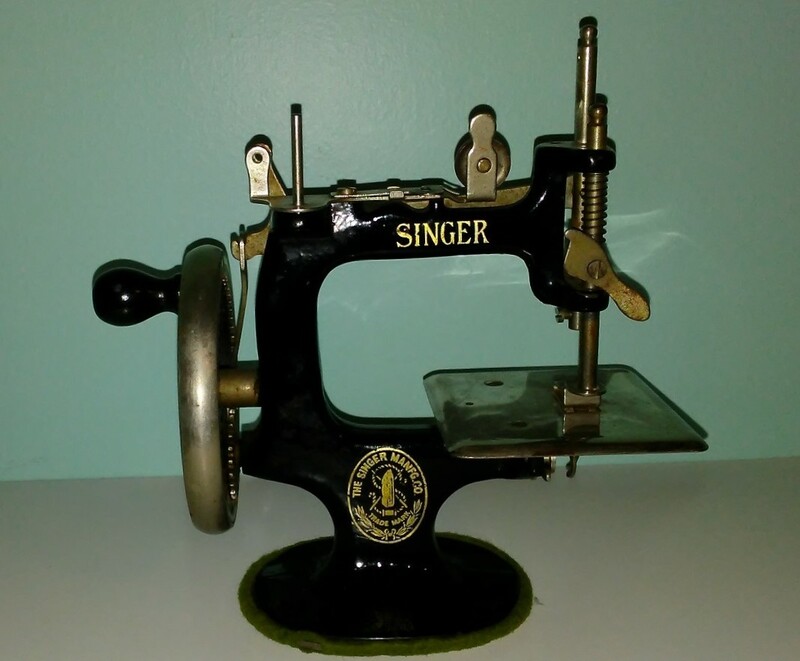 My grandmother, like many Italian-American women, was a seamstress. As a young woman, she worked in a sweatshop in Lower Manhattan. After she married and had a family, she worked in a sweatshop closer to home, in Queens. She was a working woman – a working mother – long before it was commonplace. And my mother was a latch-key kid before there was such a term. Over the years, my grandmother sewed men’s shirts, women’s blouses and skirts, and even crisp white nurses’ uniforms. As a “piece worker,” her job might be to sew on the collars, or attach the sleeves, whatever was needed. She didn’t work as a means to fulfillment. She worked to maintain the basic necessities of life. The stories I heard about the sweatshop left a profound impression on me. The piece workers’ pay was based on the number of pieces they completed. And the pay per piece was barely pocket change. The seamstresses were forced to work at warp speed, with inspectors scrutinizing the finished garments to ensure high quality. A bell signaled the beginning and ending of the lunch break, during which the women sat at their sewing machines eating their brown bag lunches. They didn’t even stop to go to the ladies’ room until it was an emergency. And there were no employee benefits of any kind. Sweatshops were so named because in summertime, large noisy fans kept the air circulating, but did not cool the sweltering rooms, crowded with women who were literally drenched in sweat. Now airborne from the whirling fans, the abundant fabric fibers and lint easily stuck to the women’s skin. Today’s workplace feeds the 24/7 culture and the 9-to-5 workday is fast becoming obsolete. Workers are expected to check email at night and on weekends. Meetings are routinely scheduled between 12:00 noon and 2:00 pm so lunch breaks are sacrificed, and it’s not uncommon for workers to skip eating a meal all together. When staff leave and are not replaced, the remaining workers’ workloads increase, sometimes twofold. Earned vacation cannot be taken, and is lost. Working mothers are in conflict – work late or go to your child’s soccer game? And the single woman is expected to work late – because she doesn’t have a family. A woman I know made a conservative calculation of the extra hours she worked, for no additional compensation, over a three-year-period, and was horrified when she realized the five-digit sum could’ve bought her a new, mid-sized car for cash, or better yet, secured the down payment for a condo. Years ago, a brand of cigarettes that was specifically created for, and marketed to, women ran an ad campaign with the tag line, “you’ve come a long way, baby.” Is the modern workplace the new sweatshop and, have we really come a long way? It’s Thanksgiving night and the holiday is winding down. At least for me, that is. But in a few hours, some of you, armed with a travel mug full of coffee, will be headed out to the malls for Black Friday. This shopping frenzy makes me nostalgic for “The Basement” so here is a re-post from February 2016. Let’s meet at The Basement on Saturday. Wanna go down to The Basement after work? These phrases were on the lips of Bostonian women of all ages. That’s what we called it. The Basement. I am, of course, referring to Filene’s Basement, located on two floors beneath the art deco flagship Filene’s department store and cornerstone of Boston’s Downtown Crossing. The Basement folklore was plentiful. The Running of the Brides, so named for its resemblance to Pamplona’s Running of the Bulls, turned ordinarily polite young women into fierce competitors the moment The Basement doors opened, as they fought over designer bridal gowns offered at a fraction of their original prices. And men would actually stand in line waiting for The Basement to open on the mornings of the semi-annual men’s suit sale. But the outrageous bargains were only part of it. A trip to The Basement could cheer you up on a rainy day. It was as loud, as crowded, and as chaotic as Times Square on New Year’s Eve. The Basement was pure joy. The three-dollar Christian Dior bras I pulled from the depths of the lingerie bins were mine for the taking. And the shoes! I thought nothing of squeezing into incredibly cheap Ferragamos and Via Spigas that were only a-half size too small. There were no dressing rooms in The Basement so I’d angle for a spot near a mirror then strip down to the Danskin leotard I’d worn under my clothes. 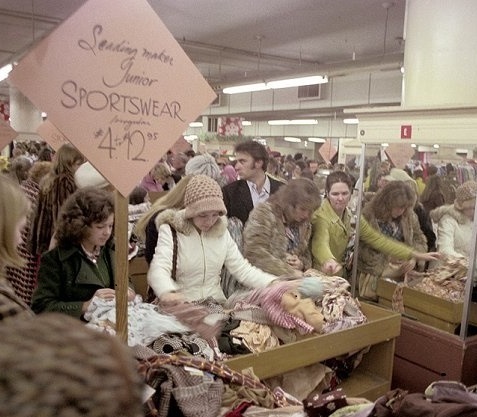 Some women were so intent on getting a bargain that they tried on their finds right over their clothes. Others, caring nothing about modesty, were on full display in their bras and slips as they tried on a pile of potential purchases. It was divine pandemonium. 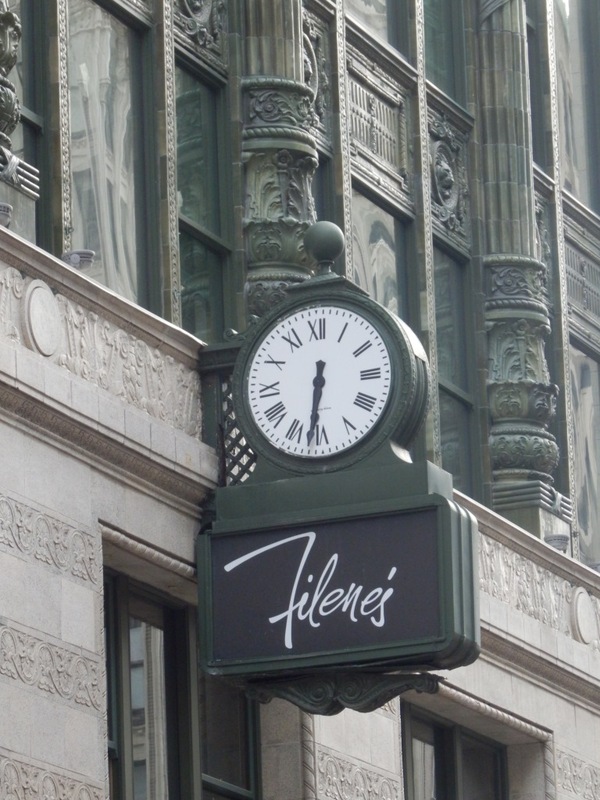 In 2007, Filene’s Basement closed its doors for good and shopping has never been quite the same. I’ll always miss the tradition and the spectacle that was The Basement. 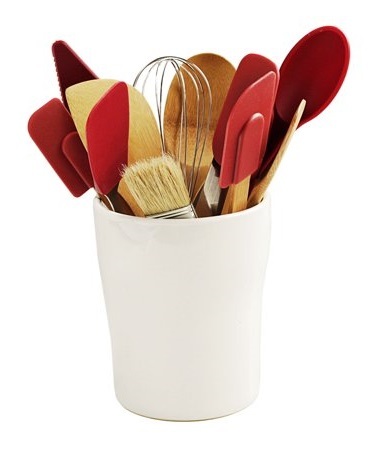 My office recently held its annual “pot luck lunch” which should’ve been called the “no luck lunch.” The Tupperware and CorningWare were sorely outnumbered by the bakery boxes and other pre-packaged, store-bought items. In fact, there were so few homemade dishes that the office manager, fearing there was not enough food to go around, ordered in several trays of salad, sides, and main dishes from a nearby restaurant. Having said that, my officemate’s Tupperware and my CorningWare were present and accounted for on that big conference table. While I understand that not everyone has the cooking gene, still, it was disappointing to see that there were so few cooks in the group. After all, the plethora of cooking shows on cable television would have you believe that everyone is in the kitchen whipping up either a weekend feast or a quick “Tuesday through Thursday night” one-pot meal. A common complaint I hear is that there’s no time to cook. Yet my officemate – a mother of two, who doesn’t have a dishwasher – found the time to cook. And despite my daily three-hours of commuting, so did I. Have you ever heard a woman say, “Oh, I don’t cook,” with a nuanced tone, or a subtle hand gesture that implies she thinks that cooking is trivial or demeaning? While it’s her prerogative to feel that way, and her choice whether or not to cook, it troubles me that the remark makes those of us who do cook feel as if our culinary endeavors lack value. After all, isn’t cooking the most gracious form of hospitality? As for me, after a stressful day, nothing relaxes me more than going into my kitchen. Mia cucina. That time is sacred to me. The moment I start chopping some vegetables, or sink my hands into a bowl full of flour and butter…well, I become transformed. Besides, cooking is not only a great stress-buster – you end up with something to show for your efforts. Something tangible. Something nourishing. Something delicious. Two days after the office pot luck, my officemate’s son informed her that he’d signed her up to help with a school bake sale. She had two days in which to bake four dozen cupcakes. I loaned her one of my muffin tins so she could do two batches at a time. So, here’s a message to all my fellow cooks: Cooking is both a skill and an art. It doesn’t make you seem old-fashioned, or any less a feminist. What you do matters – and it is appreciated. The following is a re-post from October 2017. Pumpkins, large and small, adorn nearly every window box and doorstep in my neighborhood. Along with the usual ghosts and witches, we here in the Bay State have easy access to the ultimate Halloween spectacle. Salem may be a quaint New England town steeped in history, mythology, and magic – but Salem in October is way too touristy for me. 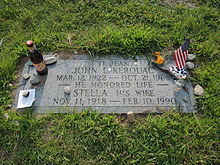 Instead, I take a day trip to Lowell to visit the grave of one of my literary heroes – Jack Kerouac. 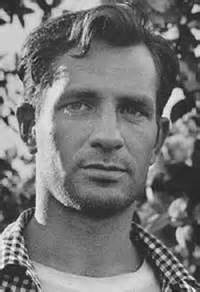 There had been many recent visitors to the grave, fans, and writers perhaps, because they’d left unopened bottles of imported beer, packs of Camel cigarettes, flowers, and sheets of poetry, some handwritten and some typed, in several different languages. I sat on the ground and took out a bottle of champagne and my worn paperback copy of On the Road. I purposely shook the bottle so that when I popped the cork, the bubbly came gushing out just like it does in the winning team’s locker room. I took a small drink before pouring the entire bottle onto the grass, letting it soak right into the ground so he could enjoy it. Then I opened my book to a random page and started reading. There in that graveyard was all the history, mythology, and magic I needed.